I love the combination of pecan and maple. It's like Fish & Chips, some things just work well together. 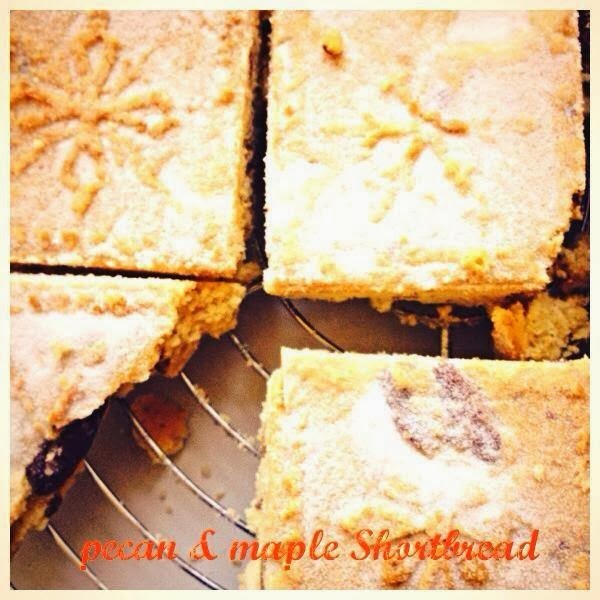 I baked my shortbread in the gorgeous Nordicware snowflake tin but you can just use a regular 20x20 pan. You will also need a 20cm x 20cm tin, greased and lined with baking parchment. Preheat the oven to 160ºC/310ºC/gas mark 3. Place all of the ingredients except for the pecans into the bowl of a food processor and pulse together until the mixture comes together to form a soft, clay-like dough. Now add the pecans. Press firmly into the lined tin in an even layer. Bake on the middle shelf of the preheated oven for 30-35 minutes or until the shortbread is a pale golden colour. Sprinkle with caster sugar, leave to cool for 10 minutes in the tin and mark out nine portions. Leave to cool completely before serving.